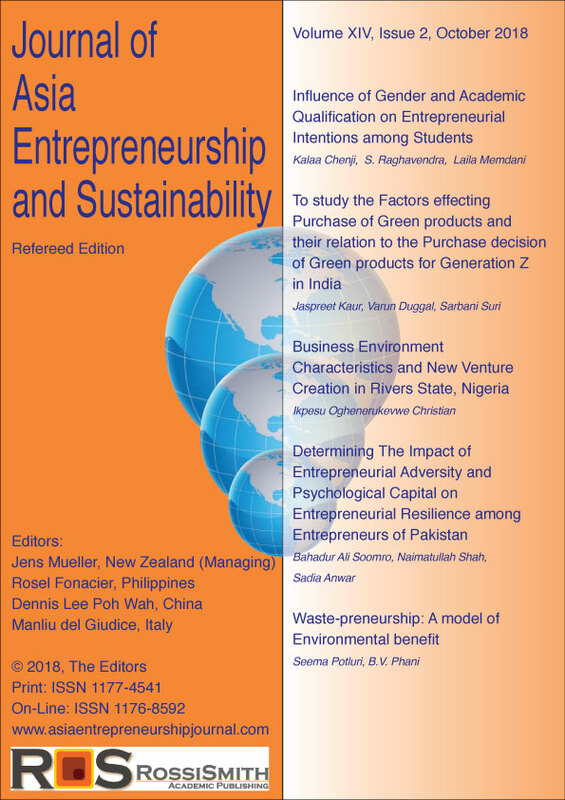 The Journal of Asia Entrepreneurship and Sustainability is a ranked, double blind-refereed journal, without no fees charged to authords in any way. Our editorial board includes academics with competence in all areas covered by the journal and is distributed globally. The Journal publishes several standard editions annually, as well as Special Editions in conjunction with international conferences. We now also publish foreign-language editions. We are a member of Crossref.org for DOI registrations of all intellectual property here and ranked by ABDC and JournalBlockChain.org . This Journal is the result of extensive collaborative efforts between academics of some of the leading global universities, and corporate leaders with an interest in effective and sustainable entrepreneurship and innovation activities that that practically relevant. We publish material that helps bridge the gap between academic approaches to entrepreneurship, rooted in a robust dialogue among the disciplines, and the demands of business leaders worldwide, for long-term effective tools. If you are an academic with an interest to contribute as author or editorial board member, if you are involved in business ventures where innovation, empowerment and sustainable entrepreneurship is a foundation requirement, and if you are a student or emerging manager: This Journal is for you! Through the generous support from individuals and corporations, the Journal is available at no costand publishes several refereed editions annually. If you are organizing a conference with a similar theme, ask us about a Special Conference Edition, to feature key contributions to your conference. Member of the Editorial Board Professor Sara Carter is the Director, Entrepreneurship Centre, Department of Management and Organization, University of Stirling, Stirling, Scotland. Her research focuses on entrepreneurship and the small firms sector. A core theme of Dr Carter's work examines the issues facing different entrepreneurial groups, particularly women, rural business owners and portfolio entrepreneurs.